What are intraspecific or F1 hybrids? Intraspecific or F1 hybrids are the result of crossing genetically divergent individuals from the same species. 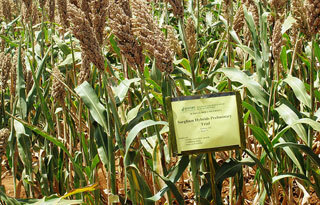 Grain yields of sorghum could increase by 25% or more if hybrid seed systems could be implemented in Africa. The HOPE project is exploring this possibility. Hybrids are sometimes stronger than either parent variety, a phenomenon known as hybrid vigor (or heterosis). An economically important example is hybrid maize, which provides a considerable seed yield advantage over open pollinated varieties. An additional advantage of F1 hybrids which is very important to farmers is their uniformity: all the plants in the population will grow and develop at the same rate. This agronomic characteristic makes the crops easier and cheaper to manage. The seeds of F1 hybrids are not sterile. However, subsequent generation will not be uniform, and due to genetic segregation of alleles during sexual reproduction, not all the individuals derived will contain all the desired agronomic characteristics found in the hybrid. This is why farmers are advised to either buy or develop new hybrid seeds each time they plant. Therefore it is important for farmers to determine whether the economic advantage of growing F1 hybrid crops offsets the cost of the seeds each year. And of course farmers need to be able to afford to purchase the seeds in the first place, so access to funds is essential. How are simple traits inherited? How does sexual reproduction generate genetic variation? Plant genetics and crop breeding I. What is the main requirement for basic plant breeding? Where do plant breeders find genetic diversity? What is a gene bank? What are cultivars, clones and landraces? How do plant breeders cross plants? How do plants reproduce asexually? I. How do plants reproduce asexually? II. Plant genetics and crop breeding II. Why were F1 hybrids developed? What is a maize f1 hybrid? What are the disadvantages of F1 hybrids? How do you develop a new crop variety by genetic modification? How do you develop a new crop variety by conventional breeding? How are genetic traits inherited? What is the difference between yellow and white maize? How do you develop a new crop variety by marker-assisted selection (MAS)? Why do breeders backcross elite events into elite varieties? Is the current regulatory approval system unsuited for the improvement of vegetatively propagated crops by GM? What is the difference between an F1 hybrid and a GM plant? What are the advantages of gene stacking?